Bunion deformities are often part of a more generalized problem related to improper foot motion as you walk. The name for this is "pronation". Wearing orthotics can slow the progress of a bunion deformity. There are presently over 25 types of bunion procedures performed today. The choice of procedure is based on many factors including age, medical history, physical exam, and x-ray evaluation. Bunions are among the most common problems of the foot. 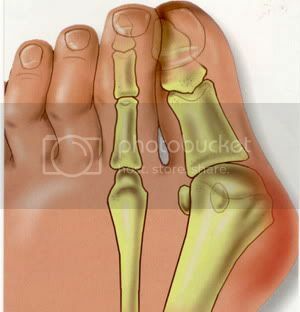 They are several possible reasons a bunion may develop, though a biomechanical abnormality (improper function of the foot) is the most common cause. In an unstable flat foot, for example, a muscular imbalance often develops that, over time, causes bunions. Bunions tend to run in families, and most podiatrists believe that genetic factors play a role in predisposing some people to develop bunions. Poor shoes, like high heels and pointed toe boxes--exacerbate the condition by speeding up the development of bunions, and by making bunions more painful. Poor shoe choices is at least one of the reasons bunions are much more common in women than men. In addition to the typical bump, signs of bunions can include red, calloused skin along the foot at the base of the big toe. With bunions, you may also develop calluses on the big toe, sores between the toes, ingrown toenail, and restricted motion of the toe. Some bunions are small and painless and some are large and extremely painful. Pressure from shoes worsens the problem. You can try over-the-counter remedies like pads to stop them rubbing, or take painkillers such as paracetamol or ibuprofen if they play up. Devices that fit into your shoe, called orthotics, or splints that you wear at night, can slow the progression of bunions. 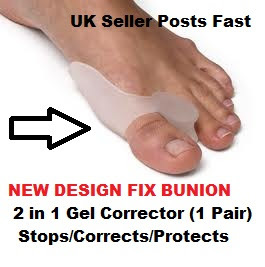 If these don't help and the bunion is causing a painful and substantial deformity that?s seriously limiting your footwear, your GP will probably refer you to see a podiatrist, medical professionals who specialise in feet. They can give further advice about non-invasive treatments and also refer you for an operation, either with a podiatric or orthopaedic (bone) surgeon, ultimately the only thing that can correct the gnarly blighters. You can visit a podiatrist privately, which will cost anything from ?140-?200. But Mike O?Neill, spokesperson for the Society of Podiatrists and Chiropodists, suggest always going via your GP, who will know the best qualified. Such is the complexity of the bone structure of the foot, there are more than 130 different surgical procedures for bunions. One person?s op may be very different from another?s, so be wary of sounding out a friend about theirs. Most bunions can be treated without surgery. But when nonsurgical treatments are not enough, surgery can relieve your pain, correct any related foot deformity, and help you resume your normal activities. An orthopaedic surgeon can help you decide if surgery is the best option for you. Whether you've just begun exploring treatment for bunions or have already decided with your orthopaedic surgeon to have surgery, this booklet will help you understand more about this valuable procedure.